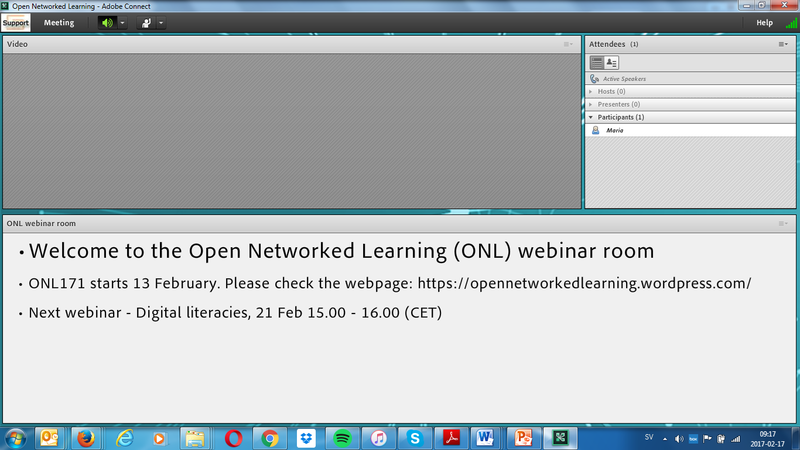 Welcome to this webinar on Thursday 9th March at 15:00-16:00 (CEST) which will be a discussion on the theme of open education. We will be joined by Teresa MacKinnon from the University of Warwick in England who has long experience of working with open educational resources and training teachers in open education. After watching the introduction please post your questions and thoughts on this Padlet page that will be the basis of our discussion webinar. For more information about Adobe Connect please watch this short video as well as an overview or a written guide (pdf). You will however not have to use camera or microphone if you do not specifically want to ask questions outside the chat. Teresa is an award winning language teacher with a wealth of expertise in online delivery and a good understanding of assessment issues in language learning. Experienced in education management and course design in secondary and higher education, Senior Fellow of the Higher Education Academy and Certified Member of the Association for Learning Technology, Teresa has extensive experience of the integration of computer-mediated communication. Her twitter presence as @WarwickLanguage has over 4,500 followers, named by Jisc as one of UK Higher Education’s top 50 social media influencers, actively connecting language educators internationally across sectors. She advocates open educational practice.